All have a logo at the top right corner that leads user back to the homepage. All have footers with contact information highighted (address, phone, etc..). All have menu buttons arranged horizontally on the top of the page. All have a top navigation highlighting pages. All have content-heavy front page layout with little white space. All have some social media integration, but 826Seattle has buried it at the footer. The other 2 have them prominently displayed at the top. 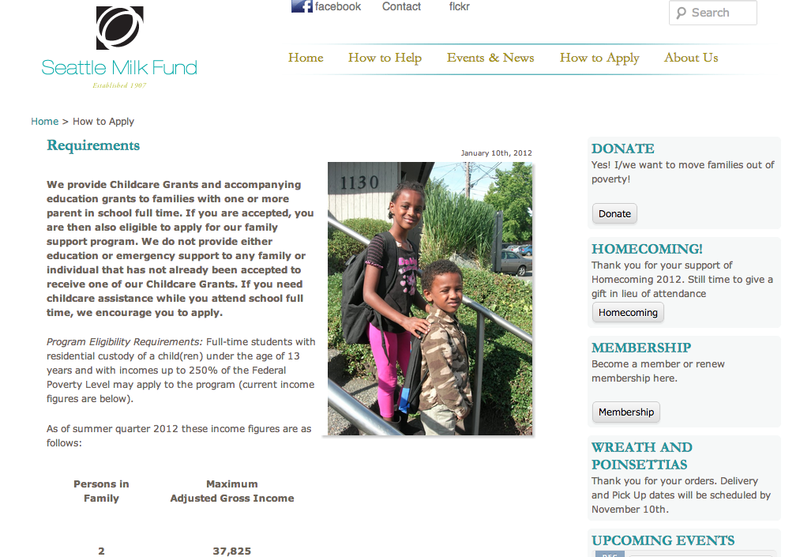 All have “donate” buttons in top navigation, but SeattleMilk button is drop-down from “how to help” button. 826Seattle is the only one of the 3 with a 2 column design, the other 2 have 1 column design. 826Seattle has the most refined design, overall aesthetic more reminscent of old magazine than a blog. The other 2 have blog-like theme. SeattleMilk is the only one without a large image banner at the top (has rotating images). 826Seattle is the only one without a search button on the top navigation. SeattleMilk has a Google Calendar integration. All 3 have differing numbers of pages necessary to donate. SeattleMilk has 2 calls-to-donate on the homepage with the “donate button” opening in the same window, but the “how you can help” -> donate, opening in another window, the other 2 open in same window. SeattleMamaDoc requires only one click to get to enter method of payment (MOP) to donate, 826Seattle requires 2, SeattleMilk requires 2 and the call-to-action “donate” button is buried in the page with other text. 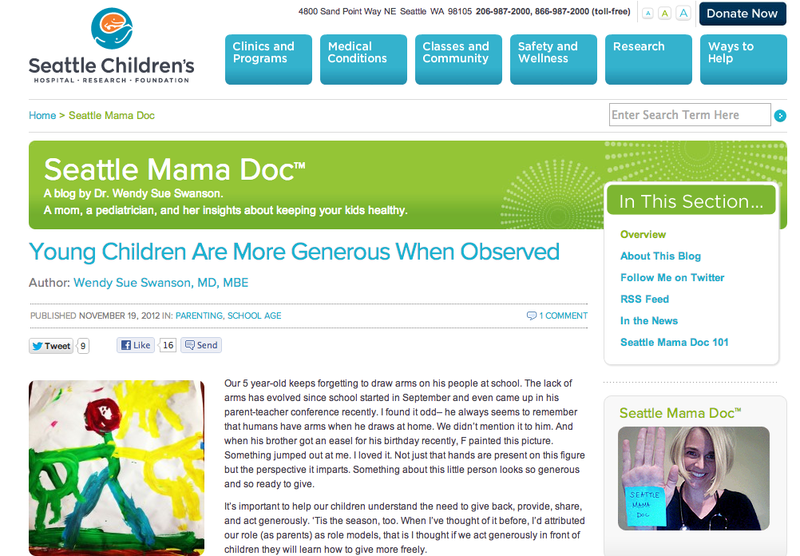 SeattleMamaDoc is a blog on Seattle Children’s Hospital, but other 2 are stand-alone websites. Personality-driven site that highlights image of the personality immediately. Limited calls-to-action which simplify the message. Clean lines with a lot of white-space that make the site appear to have more content than it really does. Logo is confusing and does not depict the brand identity clearly. No child/infant or baby image to establish a connection between service and organization. Award and recognition deep down at the bottom whereas it should upfront to establish credibility. Duplicative information (contact information) at both header and footer. This website is bland, sterile, and passive perhaps to reflect hospital’s brand – so not ugly or pretty. Pretty aesthetic, website looks great. Calming Green and old-timey feel. Good use of colors and typography. Mission statement is less prominent. Takes too many pages to make a donation. Nope, this website is really pretty. The logo is prominent and stand out because of the color and good use of negative space. Good use of Serif typeface for the menu buttons to distinguish between the other elements of the page. Clean and good symmetry on the homepage. Sub-navigation seems intuitive and to make sense. Disconnected images to the mission statement of the Org. The website look and feel is not appealing. Success story at the bottom with minimal importance. Yes, this is an ugly website with poor Facebook integration, and what appears to be “frankensteined” plugin’s for buttons. Increase donations to Seattle Children’s Hospital. Create and cultivate Dr. Wendy Sue Swanson as healthcare and local personality. Create and build awareness as a resource on advice to young parents on child health and treatment. Inspire young parents through Dr Swansons idealogy of Hope. Care. Cure. Derive results based on thorough research and compassion for child’s health care. The very simple and cool color scheme makes the site mature and helps to establish credibility amongst the target audience. The site navigation and logic is very effective and relevant for the target audience. Although the site is content and information heavy but it is organized and systematic in a sequence. Appropriate use of child and parents image in combination in the rotating slide on the front page establishes a visual connect with the target audience about the site. Raise funds for this National non profit educational organization. Build awareness in local community of this resource. Committed to help youth improve creative and expository writing skills also to help teachers inspire their students to write. Place high importance on writing skills and provide one on one coaching on. Website reflects the business goals effectively primarily by showcasing students work on the front page. Good use of typography and colors establish sequence and appropriate prominence to the elements of the website. Simple and easy navigation makes the website intuitive and appealing. Aesthetics, design and cleanliness depicts professionalism and the effort dedicated to creating an effective website for users. To raise money in support of senior citizens and parents interested in receiving subsidized higher education. To raise funds in a number of ways from charity, membership, donation, homecoming events and as well as buying seasonal gifts. Raise awareness of the organization. Rotating images of parents and old people in addition, a clear and simple use of colors and typeface establish the brand identity. Simple navigation with symmetrical scroll down allows subpages to retain the menu buttons to navigate easily around the site. The basic blue and white color scheme is not distracting and easy on the eyes. Frank Johnstone is a 36 year old Seattle native. He is the single father of a 11 year old boy named Joseph who he has raised by himself from birth. Joseph is a 4th grader at a local elementary school. Frank is a construction worker, but with the slowdown in building, has only been able to find part-time work recently. He uses the internet regularly to look for jobs on craigslist as well as information on how to parent and is actively looking to support his son’s education anyway he can. He is uninsured, but a smart and responsible person who is pretty tech savvy. He regularly uses the internet (over 10 hours per week) and he spends the most amount of time on Facebook trying to connect with like-minded dads. He is also an aspiring writer, contributing to a blog called DaddyKnowsBest periodically. Frank spends a ton of time on Facebook trying to connect and he has found many resources for single mothers in Seattle, but not a single one for fathers; so he’s come up with an idea to create a “Single Dad’s in Seattle” group on Facebook, to fill this void. Since he has been raising his son on his own for so long, he knows that health care and education are the 2 most important, yet hardest, things for single dads to navigate. As such, he goes about searching for resources for his Single Dad’s in Seattle group so that he can create this repository of information on Facebook that’ll be most impactful for single dad’s. Frank tries to remember some of the most trying times he’s had as a single parent and invariably he remembers late nights where Joseph was feverish and he as a parent didn’t know what to do. 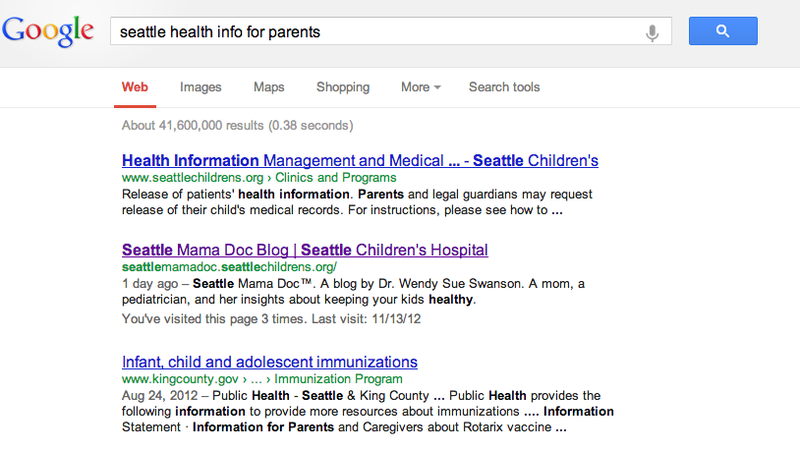 He googled, “Seattle Health Info” and saw that the first 2 results were for Children’s Hospital websites. He was drawn the personal nature of the Seattle Mama Doc Blog site and thought it a natural fit for his Facebook page. When he clicked through to the website, he saw the blog format which made searching for specific ailments difficult, but liked the personality of it’s curator. He read the About section and was particularly impressed with the line, “parents just want to do what’s right” coupled with the truth that there is no definitive truth, and the call-to-action soliciting feedback from other parents, “Speak up. Keep me posted on what you think.” — which is a line he decided to co-opt for his parent group. Franks begins by doing a Google search for “Seattle after school education” because he knows that this has tremendous value to parents. 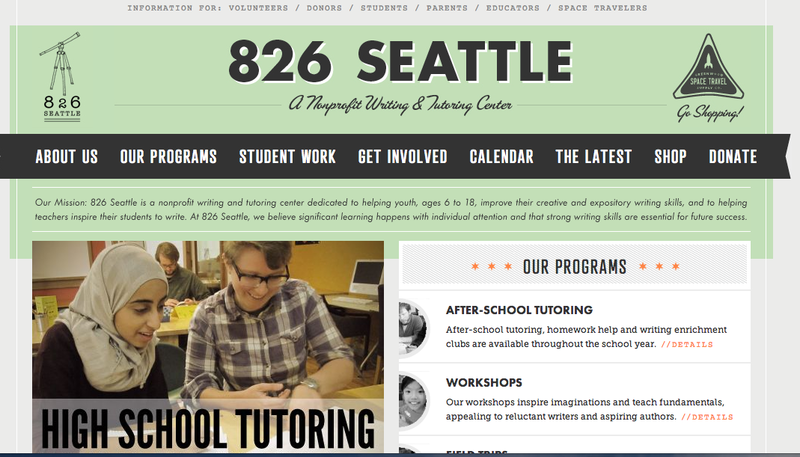 826Seattle is on the first page of results and seems to be the most interesting, touting creative writing. When he clicks through to the site, it seems very genuine and credible. He looks at the student work on the portfolio portion of the website and sees that this organization is making his own dreams of writing come true for its students. He clicks through on “our programs” ->after-school tutoring and is sold on this as service for both his son now and single-fathers with kids of varying ages (because they have programs for kids elementary through high school). As education is the 2nd tenant of his single parents group and Joseph himself never finished college, he decided to find out if there were any resources for low-income parents like himself to go back to school. He went to the University of Washington and went to the childcare office which referred him to Milk (you can see on the Milk website that it has referred others as well). He went to the calendar from the homepage and saw that there were on average 1-2 events per month and chose one in December to go visit. He went to the contact page and was really impressed that contact information (both email, phone number, and job title) were clear so he didn’t have to submit a form and hope to get in touch. Frank highlighted all 3 services on his “Single-dad’s of Seattle” Facebook page after discussing with each one. He was impressed with how each one had very clear contact us options from the homepage navigation that didn’t require any extra steps. He found the first 2 sources on his own from Google searches, but he was happy to have collected such good sources for his burgeoning group. All 3 organizations had not been affiliated with any groups catering to single dads and were eager to lend their brands to his cause. From his starting of his city single dad group, he was able to scale it to other cities and eventually a national website catering to single dads.